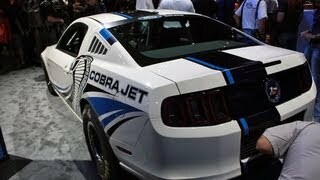 The Journey started back in 1968 when for the first time original Mustang Cobra Jet landed the market. 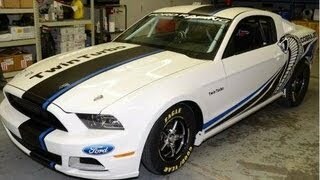 Its powerful 7- liter V8 engine with four-barrel carburetors and whooping power output of 335 HP. Ford seems to be like over a never ending boulevard of defining performance. 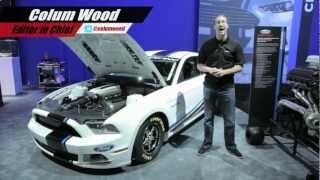 The 2012 Sema Auto Show became witness to the legendary reveal of Ford Mustang Cobra Jet Twin Turbo Concept 2012. The Concept under its hood brings a pair of twin turbochargers attached to the 5.0 liter V8 engine. The idea here is to eliminate the superchargers which though provide instant demand on power but lose the same at high boost levels. Looking at the Ford Racing which benefits least power loss, the turbocharger system is adapted to use Ford’s EcoBoost engines. The installed turbochargers in Ford Mustang Cobra Jet Twin Turbo Concept 2012 features, turbine wheels made from titanium aluminide. The amalgamation thus reduces rotational inertia by 50 percent with this joins the low friction ball bearing holding shaft riding, enabling the compressors to spin up to whooping 150,000 rpm almost in an instant. This entire club making the system eventually provides effective responsiveness with very low inertia and internal friction. For any basic model or be it a super powerful model like our Ford Mustang Cobra Jet Twin Turbo Concept 2012 its exterior too counts to a lot of extent. So before we sign off with this article and the 2012 Concept by Ford let us also have a look at the exterior of Ford Mustang Cobra Jet Concept 2012. The exterior is impeccably an eye grabbing piece of art. The Concept Car from Ford is given white finish getting accompanied by asymmetric black and blue stripes from bumper to bumper, touching the Cobra head giving it aggressive and bolder look.